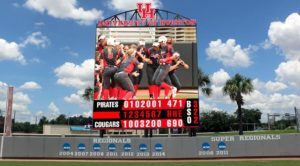 The University of Houston (UH), in conjunction with IMG, has asked Daktronics to design, manufacture, and install the largest LED video display for a Texas softball venue at Cougar Softball Stadium. The fifth largest softball installation Daktronics has ever completed will encompass 576 square feet, set for completion early in 2018. “A state-of-the-art video board will immediately elevate the game-day experience for our fans and student-athletes,” UH Head Softball Coach Kristin Vesely said. “Fans will have the ability to see replays and the personalities of our players on the big screen, while the board’s capabilities also opens doors for in-game marketing and quality streaming opportunities. The new outfield display will measure 24 feet high by 24 feet wide to bring a large presence to every game as it engages and entertains Cougar fans with live video, instant replays, statistics and scoring information, graphics and animations, and sponsorship messages. It will feature a 13HD pixel layout for to bring crisp, clear imagery for a great view from every seat in the stadium. The display is capable of variable content zoning allowing it to show one large image or multiple zones of differing content to bring fans the information they crave at every event. Included with the installation, the university will receive a content package to be created by Daktronics Creative Services, an award-winning, in-house creative team, at the request of the school. Daktronics LED video and messaging display technology provides industry leading environmental protection for a long lifetime with consistent performance and low power consumption, providing value and excitement for years to come.